This article first appeared in the Rushville Republican on June 13, 2017. 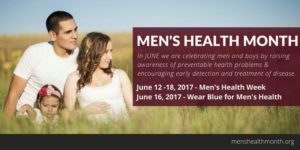 Friday, June 16, 2017 is national Wear Blue for Men’s Health day. The Rush Memorial Hospital and Rush Memorial Hospital Foundation are asking Rush County businesses and residents to wear blue that day in support for men’s health awareness. Rush Memorial Hospital is declaring Friday as “Blue Friday” at the hospital. Statistics gained from www.menshealthnetwork.org show that on average men live 5 years less than women. They also have a higher death rate from the leading causes of cancer, heart disease, diabetes, and suicide. One in two men will develop cancer and approximately 30,000 men in the U. S. die each year from prostate cancer. To make an appointment or speak with a provider contact RMH Healthcare Associates at 765-932-7591. It’s time to lower these statistics and change the health landscape in our community. Let’s show our love and support to our men. Make a difference. Begin the conversations about PSA’s (blood test) for prostate screening, colonoscopy (for colon screening), cholesterol, blood sugar levels, blood pressure, depression, and more. You can make a change for positive health. Take the steps and contact your physician or Rush Memorial Hospital. The first step is the hardest, but can be the most important.